In Corsicana you get the best of both worlds: a center of unparalleled arts and the best of what Texas is known for: food, shopping and recreation. Quaint and historic Corsicana is located at the intersection of Interstate 45 and State Highway 31. A crossroad for Texas- Dallas, Houston and Waco are easy access. 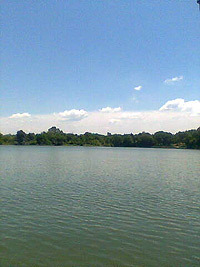 Just southeast of Corsicana is Texas' third largest lake, Richland-Chambers Lake. The region as a whole consists of small suburban towns broken up by expanses of rural land. The area offers a wide choice of employment opportunities from medical to educational and retail to distribution. The art culture is rich with the Warehouse Living Arts Center producing five shows annually and featuring year round art exhibits in the gallery. The Palace Theatre, a 1921 restored vaudeville theater, hosts a performance series featuring major artists from opry to opera. On the Navarro College campus, the Cook Center Planetarium is the largest domed theater and planetarium in Texas. Home of original art works by acknowledged masters of Western Art, the Pearce Western Art Museum is also located on the Navarro College Campus and the Pearce Civil War Museum rivals interactive museums around the world. The region is also home to some interesting historic sites, including one of Texas' oldest continually operated soda fountains and Petroleum Park, the birthplace of the Texas oil industry. Other points of interest include historic homes in the Carriage District and the antique shops of Downtown Corsicana. The parks are legendary with playgrounds, paved walking trails, sports fields and sites to enjoy. Two golf courses are available: The Corsicana Country Club, a links-style course, and New Oaks Golf Course, a challenging nine-hole public course. Smaller communities also available for property searches include: Angus, Barry, Blooming Grove, Dawson, Kerens, Mildred and Rice.